Fee includes a family of 4 and all activities (except Paddle Boats & Canoes). 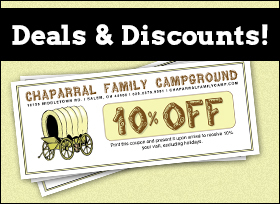 Seasonal information, Camping Clubs, Shelter Rentals, Hayrides & Group Rates available upon request. Reservations accepted at $10.00 per night. Refundable if cancelled 3 days in advance, 1 week in advance for holidays. Memorial Day, 4th of July, and Labor Day Weekends are 3 night minimum weekends for reservations. Season is from April 15th through November 15th.